It's been less than 24-hours since Attorney General Bill Barr released the conclusions of Robert Mueller's Special Counsel investigation. In a four-page summary, Barr explained the investigation found no collusion with Russia and no obstruction of justice. "The Special Counsel's investigation did not find that the Trump campaign or anyone associated with it conspired or coordinated with Russia in its efforts to influence the 2016 U.S. presidential election," the report says. "After reviewing the Special Counsel's final report on these issues; consulting with Department officials, including the Office of Legal Counsel; and applying the principles of federal prosecution that guide our charging decisions, Deputy Attorney General Rod Rosenstein and I have concluded that the evidence developed during the Special Counsel's investigation is not sufficient to establish that the President committed an obstruction-of-justice offense," Barr continued. But to leading Democrats, two years, 2800 subpoenas and 500 witnesses just wasn't enough. 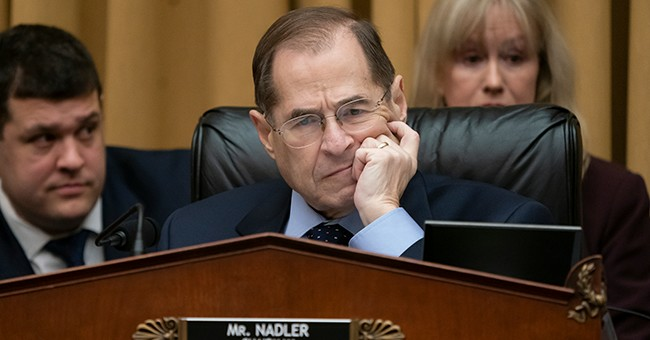 Chairman of the House Judiciary Committee Jerry Nadler is vowing to keep the witch hunt going and rejects Mueller's findings. He is convinced President Trump engaged in obstruction. Previously, he expressed 100 percent faith in Mueller's credibility. House Speaker Nancy Pelosi and Senate Minority Leader Chuck Schumer also issued a delusional statement on Mueller's findings.